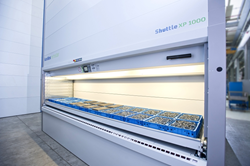 The new Kardex Remstar "medium universal" tray for the Shuttle XP Vertical Lift Module family is an extra wide tray providing greater capacity in a larger tray size. In times of mounting cost pressure, the demands on storage capacities companies must manage are increasing as well. Kardex Remstar meets customers’ needs to manage more capacity in less space by presenting the new tray type “Medium Universal,” developed for the Shuttle XP Vertical Lift Module (VLM) product family. These extra wide models provide greater capacity in a larger tray size, gaining more capacity per cubic foot. In addition, integrating even sturdier corner joints and center bars as well as higher front edges has considerably improved the strength and stability of the tray. The flexibility of the new Medium Universal tray allows implementation for both new customers in addition to being compatible with existing machines. This allows users to adjust their system to meet their specific requirements. Since the construction of the new tray does not result in reduced depth, its integration wastes no valuable storage room. The storage density gained allows users to optimally use their available space. This solution results in higher loads per tray and unit. Kardex Remstar, LLC, a company of the Kardex Group is a leading provider of automated storage and retrieval systems for manufacturing, distribution, warehousing, offices and institutions. For information about our dynamic storage solutions, call 800-639-5805, visit http://www.kardexremstar.com.